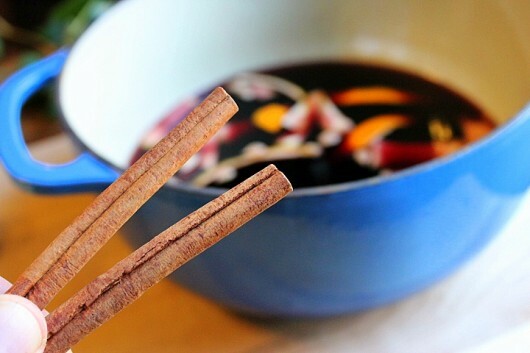 Fact #1: There are as many recipes for Glögg as there are people who like to drink it. Fact #3: Glögg, which literally means “glow,” is an intoxicating brew! 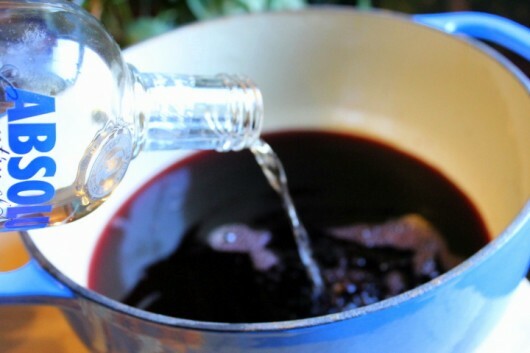 My recipe is actually an amalgamation of many “authentic” Glögg recipes, including this one from Scandanavia Today. It’s as delicious as anything. I think it tastes like pure happiness. 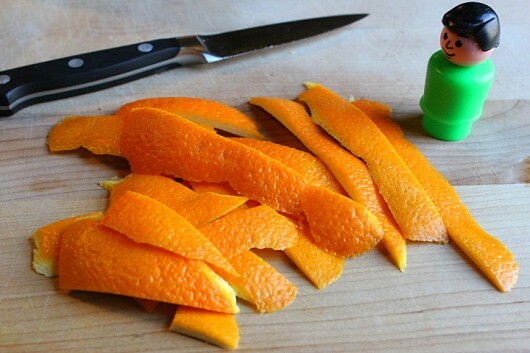 To start, remove the fragrant zest from a large orange, and cut it into strips. Set aside for a moment. 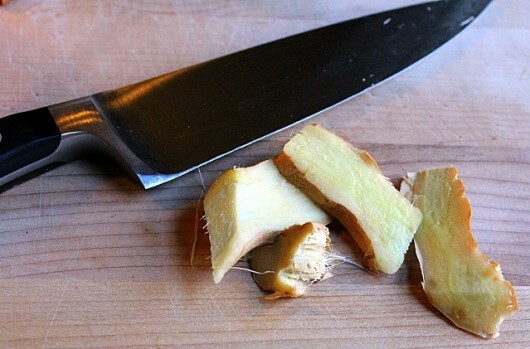 Then scrub a 2-inch knob of ginger, and slice it lengthwise into fairly-thin strips. You needn’t peel the ginger. Set aside. 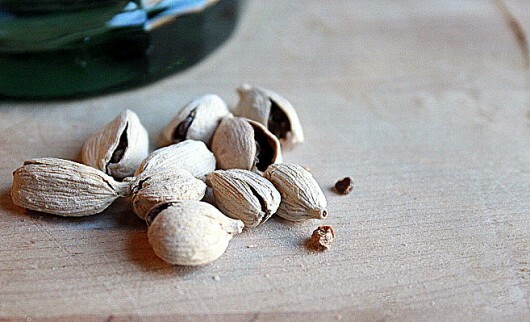 And smash them with a mallet (or use the bottom of a stout drinking glass, as I did), to release their glorious perfume. Now grab a non-reactive pot that will hold at least 5 quarts. 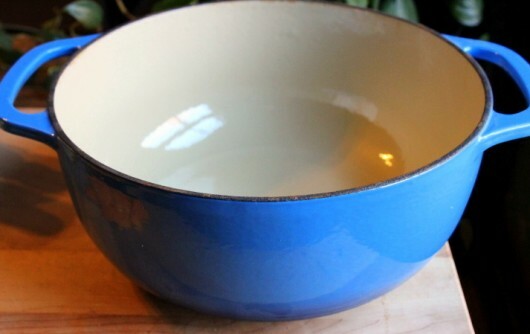 I used the blue Dutch oven that I obtained from this online source. And 2 cups plain water. 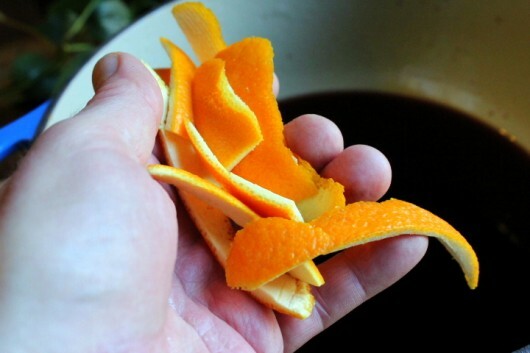 Violently fling the orange peel and the sliced ginger into the pot. No pictures of these next steps: Over a medium flame, bring the works to a simmer. 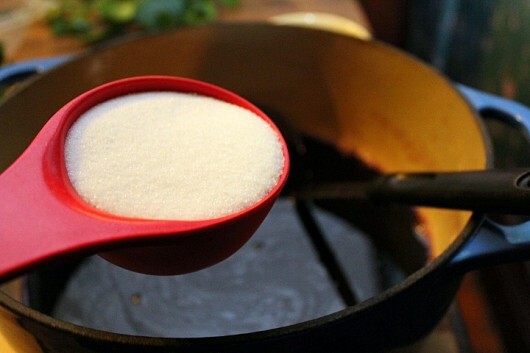 Adjust the heat to maintain a bare simmer for just 5 minutes. 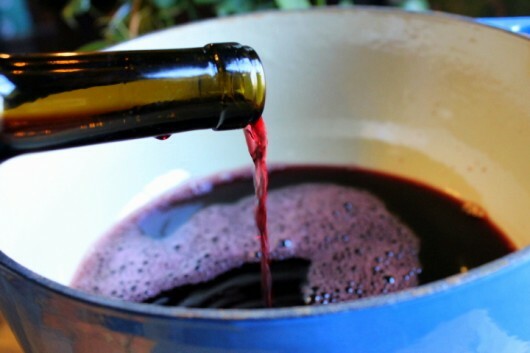 Cool to room temperature, and then cover the pot, and refrigerate for 12-24 hours. And strain the Glögg. Discard the solids. And add 1/2 cup sugar. If you’d like a sweeter beverage, then by all means add extra sugar. No picture here, because I forgot to take one: While stirring from time to time, heat the brew just to a simmer. Then hide your car keys, because we’re going to drink our Glögg! And then ladle in the purple stuff, and insert a small spoon. Why do you need a spoon? Well, after you’ve consumed the beverage, you’ll want to eat the yummy raisins and almonds that have settled at the bottom of the cup. Shall we enjoy our drinks in front of the Christmas tree? Good. Let’s head into the parlor. Folks, this Swedish sweetness rings all the right bells during the holiday season. Do me proud and make a batch, okay? 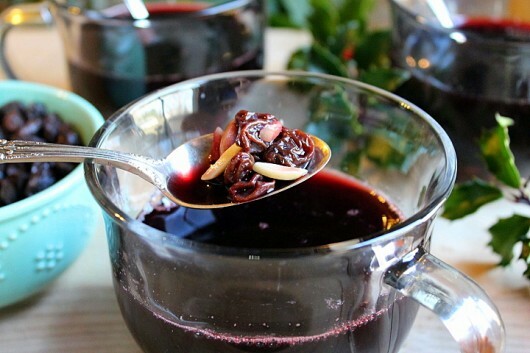 This sinfully-delicious, highly-fortified mulled wine is traditionally served in Sweden during the December holidays. For the best flavor, make the brew 12-24 hours before you wish to serve it. 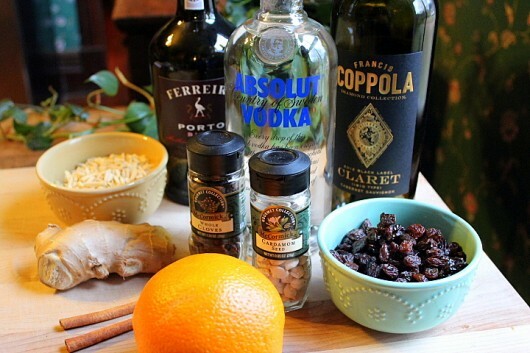 In a 5-quart or larger non-reactive pot (enameled cast iron works well), add the claret, vodka, port, water, orange peel, ginger, and spices. Bring the mixture to a simmer. Adjust the heat to maintain a slow simmer for 5 minutes. Cool to room temperature, then cover the pot and refrigerate for 12-24 hours. 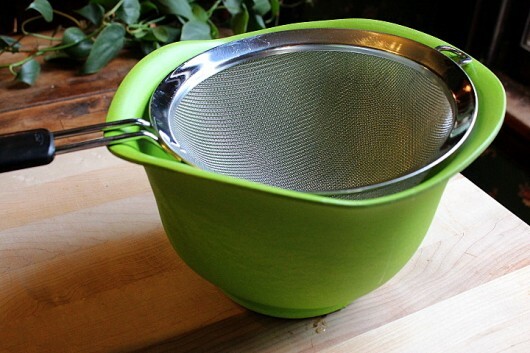 Pour the Glögg through a wire-mesh sieve set over a large bowl. 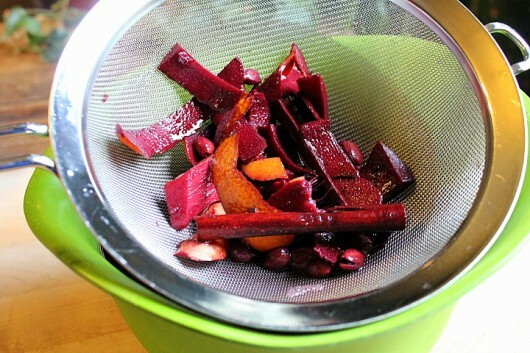 Discard the solids, and return the strained liquid to the original pot. Add the sugar. 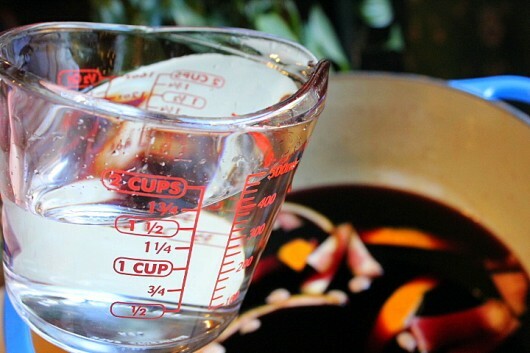 While stirring occasionally, bring the liquid to a bare simmer. Taste carefully. You might like to add more sugar. 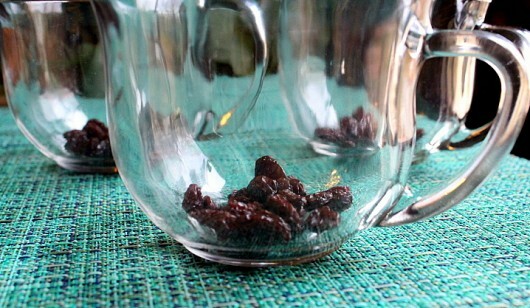 To serve, tip raisins and slivered almonds (a small handful of each) into attractive cups or mugs. 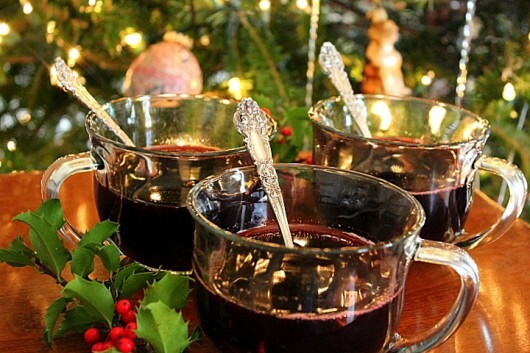 Ladle in the warm Glögg, and add a spoon. 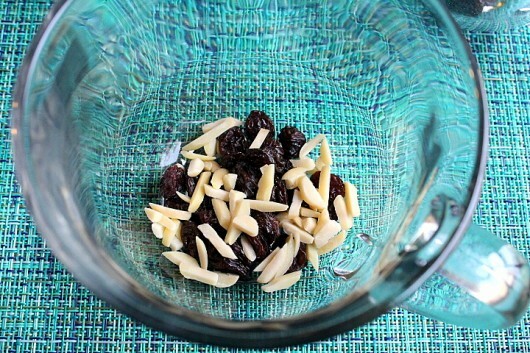 After you've consumed the beverage, use the spoon to eat the raisins and almonds. Happy Belated Birthday Kevin! I hope you had a wonderful day. I used to do this all the time for the Christmas season in Sweden, except for the peels and spices, we just went to the local drugstore and got a bottle of glögg+Spices ,all ready to go. Here I have to follow a recipe I ran out of the spice mix years ago. We always made it when we were decorating our Christmas tree. Now we don’t do a tree anymore but still make glögg at least once during the Christmas season. 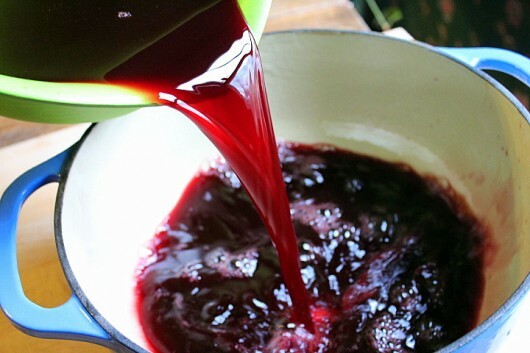 Did you intentionally omit the quality control step of taste testing the vodka, claret and port before adding them to the blue pot? A very happy belated birthday. I am so glad you were born, that you’re talented, fun, mentally curious, and that you share with us the knowledge all of that curiosity brings to you. Sounds YUMMY! Have you ever cut the recipe in half? Sounds like a wunnerful birthhhhday. Will be trying this is your honor. That last picture is just lovely!! It just screams CHRISTMAS!! Hope your holiday is just as wonderful as you are, Kevin. Cheers! Hi Melody – You can absolutely cut this recipe in half, and use a smaller pot. Enjoy! Hi Shirley B. – Well. That settles it. I’ve just changed the header photo to one you like. PS: Supremely sharp knives – oh, the danger. I need to learn new skills! I’m pretty sure I know how the reindeer fly and santa keeps warm at the north pole!!! This is SO yummy!!! What a lovely libation for the cold winter evenings!!! 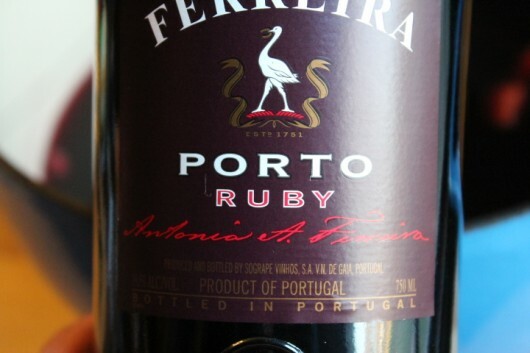 Perfectly sweet, robust with red wine and port, warm spicy goodness in a mug! 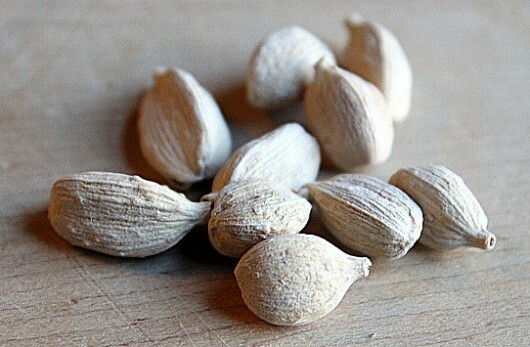 (And the raisins and almonds are wonderful too-all of those flavors soak right into them!) Thanks for sharing Kevin!!! Happy Birthday and Wonderful Holidays to you. Thank you for making my Sundays…. only reason to open e-mails! Nice Birthday drink…. I’m sure I wouldn’t remember how old I was nor would I care! This holiday beverage sounds delightful! I can’t wait to try this. Thank you for all of the interesting and informative recipes Kevin. It’s always a treat when I open up my email. Going to make a half batch this week. I’ve never had glögg and I suspect that if I do get a chance to try some, it would be outright addictive! Perhaps I ought to send your recipe to a friend of mine. She can make it and I will stop by for a sample, then flee, flee flee! Ha ha ha. Happy birthday again, Kevin and thanks so much for sharing your holiday cheer. Kevin, you’ve got to do yourself a favor and discover The Spice House. Fabulous quality herbs and spices at good prices, plus specialty blends. No comparison to grocery store spices. Sadly, you don’t have the stores we have in Chicago, but they do mail order. You just missed their 20% off sale ☹️. I was lucky and married my handsome Swedish husband. We always celebrate a traditional Swedish Christmas with lots of glögg. God Jul!!!!!! I love your sense of humor! Violently throw it in hahahaha! Your Glogg is now my official Christmas Drink. I will make this again on the 23rd so it may marinate for the 24 hours. I’m going to do a Prime Rib for Christmas dinner. I have about ten different recipes for this cut of beef, and I like all of them. I’ll figure out which in a few days. It will be roasted in my BGE. Oh! Gloog! Splendid drink of the Gods of Snow and Ice! Years ago, we would have 12th Night Parties and this marvelous beverage was always served. We’ve used different recipes over the years but somehow we got out of the habit of the 12th Night celebration. (Kids, grad schools and life can do that… )Time to get back in and revive the tradition with your recipe! Thank you! In Sweden years ago, every shop you went in from St. Lucia’s day, today the 13th, cups of glogg with pepper kakor were served. What a great smell to enjoy as you entered. The shopping became even better. Thanks for a new recipe to try. Today is the day to make it. Tak sa mycket! So enjoy your posts Kevin. I am going to use your recipe. Thank you. Kevin with the simmering is the alcohol burned off at all or is it still potent? Belated birthday greetings, Kevin. Despite the chores, it does seem you had a lovely day. God bless you. Funny you should post this Kevin. 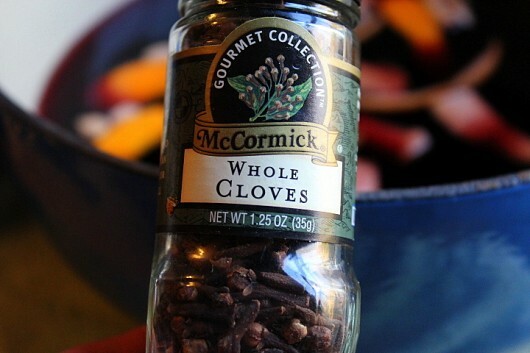 I recently obtained a recipe for Glogg that I had thought about making…. However, I think I’ll try your version as you have not let me down yet with any of your recipes! Thank you. Kevin, according to my relatives that live in France. The most popular dring is Kir. Does the alcohol not cook or evaporate out of it when you simmer it ? Loved the Christmas gift ideas. Hi Tressa – If you heat the Glögg to only the simmering stage — as I do — alcohol-evaporation will be minimal. Enjoy! Happy belated birthday! Thank you for all the tips and recipes! Hope you have a very merry Christmas and a wonderful New Year! The angels will be by your side! Love the Glögg! Sounds delicious! My kind of drink! Thank you!!!! Happy and Merry everything! Celebrate it all with gusto! Enjoy it all! Thank You for the terrific blog that livens up our lives, kitchens and gardens. Belated happy birthday and an early merry Christmas, Kevin! While I don’t post here often, I follow you and avidly read every article that comes to my in box. Thank you for running such a wonderful and welcoming site! If I’m ever in your neck of the woods, I’d be honored to take you out for a drink! Thank you for brightening my Sunday mornings with you delightful newsletters and also the fun Facebook posts. Looking forward to another year of your updates! Blessings…. Enjoy all of your decorating, cooking & fun loving humor. Merry Christmas, Kevin! My maternal grandfather made gloog (he and grandma pronounced it “glug”) every Christmas. I didn’t get the opportunity to taste it because he passed away before I turned 21. That was the legal age to drink way back when. Beginning with both sets of grandparents and going back, everyone came from Swedish. That makes my brother and I 100% Swedish. We were so fortunate to have grown up with them, enjoying many Swedish dishes that are mostly unheard of these days. So happy to read your recipe! Thank you! Happy holidays and happy everyday to you and your gang. Thanks for a great year of cooking, gardening an stuff with lots of laughs along the way. Looking forward to next year and hoping for a cookbook too! Happy Holidays Kevin, SilverFox and Lily the Regal Beagle! May your holidays be filled with joy, love and peace. Thank you for such wonderful articles. Merry Christmas and a healthy, happy and contented 2016 to you, Kevin and to every body and soul on your home! I always spend Sunday’s with you. Thank you for all the chuckles, great recipes and helpful garden tips. Happy belated birthday, Kevin! Thanks so much for the Glögg recipe, we’ll give it a try this week. Happy late birthday!! Hope it was fun. I always enjoy your e-mail messages. Sure would like to drop by for some glogg. Happy holiday Birthday ❤️ My husband used a blog reciepe from Gourmet Mazine . I loved the fragrance . The house house smelled like Christmas and for an extra bit of theatre he lit the glogg and served it flaming . We no longer make it but do start baking and rolling gingerbread Thankgiving weekend and our house smells of gingerbread for the month. OMG Kevin!! You’re never going to believe this but I am on my first ever (at age 66) overseas trip and I happen to be in Stockholm, Sweden with my husband and daughter. Last night we went to a beautiful outdoor Christmas market and tried Glogg at one of the booths. There was a long line but it was totally worth it. It was amazing. I told my family that I was going to have to look up how to make it when I get home and when I checked my e-mail tonight after a full day of sightseeing here was your recipe. How serendipitous!! I’ll be making it very soon after I get home. Happy Birthday! Enjoy your Birthday week! Happy Belated Birthday Kevin, I wish you many more 🙂 I have a question about the Cardamon. I have never used it and I researched and found that there are two drying methods. One leaves the hull white as yours are and are sun dried. The other color is green which is dried in a heated room. Yours looks to be the white variety. May I ask where you purchased them please? I like the fact that they were sun dried. Or if you think there is no difference I would appreciate your take. Thank you so much. Plan on trying your Glog. Lost my old recipe. Sure wish you were my neighbor. Happiest Belated, Kevin! May the coming “new year” be very good to you. 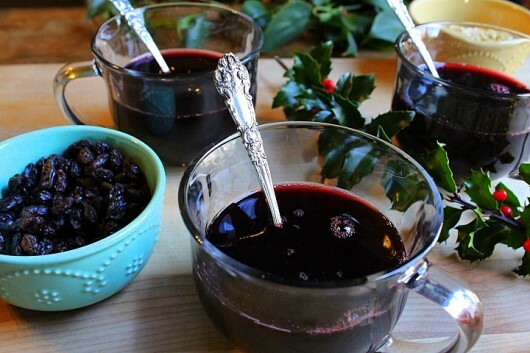 Thank you for the glogg recipe. I made this years ago for a Valentines Party. Turns out it was the coldest night of the year and everyone arrived (after a brief run from the street to front door) with chattering teeth. We collected keys and handed out mugs and warmed up the company quickly. Most went home around 4 AM filled with coffee and clutching the recipe in their still warm (but now sober) fists. I will certainly try this one, as we are planning a post-Yule bash mid-January and I have lost my original. Happy Birthday, Kevin! Love ya. Happy belated birthday Kevin! Although it sounds delicious, I haven’t made this yet. I’m woozy just reading the recipe 🙂 Hope you and yours have a wonderful Christmas and a happy and healthy 2017!